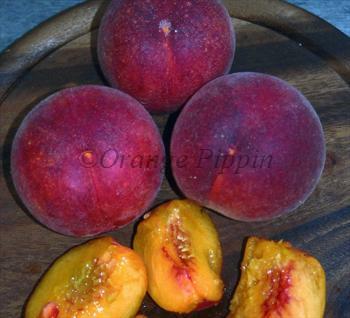 Garden Lady is a yellow-fleshed freestone peach. The pink blossom is a particular feature. It is a genetic dwarf variety, slow-growing and well-suited to growing in a pot - the height is likely to be less than 2m (disregard the standard heights given below for St. Julien rootstocks). This means you can make the best of the UK climate by growing the tree on a warm patio during the summer. Although it is slow-growing, it is also quite precocious, so you may find you get some fruit in the first or second year after purchase. Please fill in the details below and we will let you know when Garden Lady peach trees are back in stock. Garden Lady is in flowering group 3. Garden Lady is self-fertile and does not need a pollination partner, although fruiting may be improved if there is a compatible tree of a different variety nearby. Since it flowers in the middle of the blossom season it can be pollinated by most other peach trees. Best grown in a pot on the patio, and in the UK should be protected from the elements from January to May, e.g. in a cold greenhouse or conservatory. The blossom will appear in early spring, and since pollinating insects may be scarce at this time of year you can assist the pollination by dabbing the flowers with a very soft brush. As the fruitlets develop, thin them to leave a clear gap between each one. This will ensure the remaining ones grow larger and develop a better flavour. Keeping the tree under cover during spring is also a simple and very effective method for avoiding peach-leaf curl, the most widespread of diseases affecting peaches. Please note that because this is a naturally dwarf variety, you can disregard the mature height information for the St. Julien rootstock which applies to most peach trees - Garden Lady is slow-growing and unlikely to reach a height of more than 1.75m / 6ft.